Nicolás Tagliafico recently signed a 4.5 year deal with Dutch giants Ajax. The 25-year old fullback has built up a strong reputation in his home country which saw him feature in the best XI of South America in 2017. But who is he, and what can he offer to the current Ajax set-up? Born in Rafael Calzada, a city in the province of Buenos Aires, Tagliafico began his footballing career at Banfield. He made his debut for El Taladro in 2011 but moved to Spain’s second division a year later. He chose Spain despite heavy interest from big clubs like Racing Club, River Plate and Independiente. His loan-spell with Real Murcia was full of ups and downs and he returned back to Banfield at the end of the season. He became a key figure under the pair of Matías Almeyda and Ariel Holan. Banfield earned promotion to the Primera División in 2013 in which Nico played a big part. He then continued t0 stay for one more season in the top flight. However, his top performances were recognised by the big teams as he eventually joined one of the cinco grandes in Argentina: Independiente. His time at Banfield was key for his development. Matías Almeyda and Ariel Holan were two upcoming managers under whom he developed from an inexperienced fullback to one of the best in the league. He wasn’t only a key player for Independiente, he was their captain, their leader and a true fan favourite. El Taglia, as their fans called him, played 85 matches for Independiente lifting the Copa Sudamericana in his final season in Argentina. It looks like a good match beforehand as Ajax have struggled to properly fill the left back position in recent years. But what kind of player do Ajax have on their hands? Ajax has usually relied on a heavy possession-based game in the past. This requires their players to be comfortable on the ball. Tagliafico’s predecessor Mitchell Dijks was more of a robust fullback who’s crossing and passing ability let him down more often than not, mostly resulting in a loss of possession. You probably couldn’t name a better counterpart to Dijks than Tagliafico. He’s relatively short compared to Dijks and, opposed to him, does possess a lot of quality on the ball. Here we see Tagliafico creating an overlap in Alianza’s halfspace with a run he started in his own half. His remarkable speed is key in this run which sees him arriving just in time for Barco to play it through Alianza’s defence. Alianza’s defender tried to block the cross to the far post as expected and is completely out of position. Benitez even has the time to take a touch and decide whether he’s going to shoot at goal or pass it wide. Tagliafico was a key outlet for Ariel Holan on the left with his overlapping runs down the flank. His sheer amount of pace helped him get to the ball but it was his awareness that was key in this attack. Tagliafico can read the game well and you will have a tough time to find some poor decision making. However, he isn’t all about getting to the byline and cutting it back. He can provide some perfectly timed floating crosses as shown below. A long ball forward is being cleared by Godoy Cruz. Tagliafico anticipates quickly and immediately starts sprinting towards the ball. His anticipation gave him a head start over his opponent and he’ll reach the ball first as a result. A perfectly lofted cross sees Vera planting a nice header into the far corner. 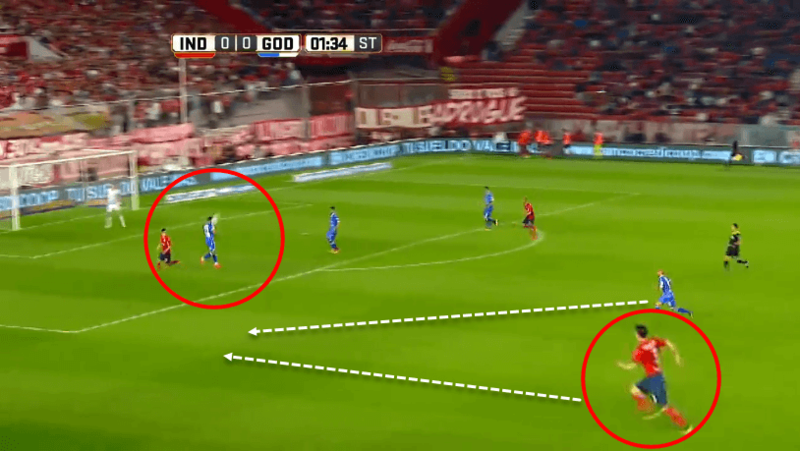 The curve and dip on the cross made it really hard for the nearest Godoy Cruz defender to defend. Nico has impressed in Argentina with his aggressive but yet clean tackling which has earned him nicknames such as El Léon and Pitbull. He could be described as a hard-working fullback who likes to agressively win the ball back. Here we can see Tagliafico tracking back after Independiente lost possession. His opponent is driving the ball forward but Nico has to cover more ground to catch him up. He utilises his pace and intercepts the attack with a risky yet rewarding challenge from behind. He does indeed play with risk but it barely results in sending offs: He’s only received one red card since 2015. 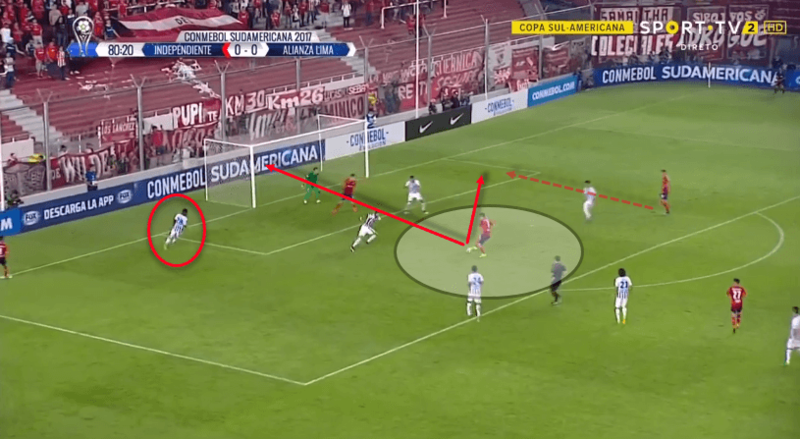 Another situation: Independiente lost the ball in a critical phase with a lot of men in the opponents’ final third. Nicolás Tagliafico decides to press forward to prevent San Lorenzo from having a dangerous counter-attack. Ajax has bought Tagliafico as a left-back but he could easily be used as a CB. Ajax quite often played in a 3-4-3 under Marcel Keizer and Nico would be a well-suited option to fill the left centre back spot. He’s played there for Independiente in a 5-at the back formation as you can see below. Despite his height (1,69M/ 5’7), Tagliafico is surprisingly good in the air. He wins his aerial battles more often than not due to his jumping reach and timing. 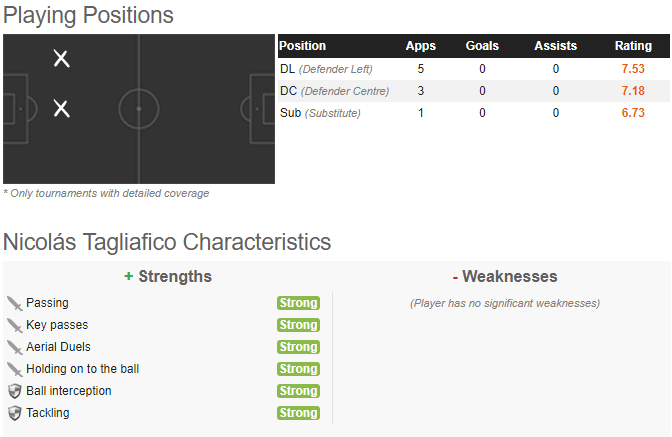 His aerial ability is listed under one of his many strengths, according to Whoscored.com’s algorithm. It will be interesting to see how Ajax’s new coach Erik Ten Hag will utilise Tagliafico when they switch to a 3-4-3. He’s got the ability to play as a wide midfielder in a 3-4-3 but his experience as a CB may see him move back a line if they indeed make the switch. His versatility is a massive asset to his game which can contribute to Ajax easily switching tactics mid-game. Ajax fans were treated well under Peter Bosz where they pressed up high and scored plenty of goals in a season where they reached the Europa League final. Peter Bosz was a big fan of the 5-second rule, a rule which stated that Ajax had to win the ball back within 5 seconds of losing it. Tagliafico is well suited to a high-pressing system with his aggressive, brave, and forward-thinking tackling. It’s still very much up in the air whether ten Hag wants to use a high press or not but it’s clear that Nico would be a great fit. According to SciSports, a Dutch statistic company, Tagliafico has instantly become Ajax’s third best player behind Joël Veltman and Hakim Ziyech. It will only be a matter of time before Tagliafico captures the hearts of the Ajax fans, just like he did at Independiente. His leadership, working ethic and personality will easily make him one of the most favoured players on the team. He will also be one of Ajax’s most experienced players with a Copa Sudamericana under his belt and could well take over the captain’s armband if and when Joël Veltman leaves. All in all Nicolás Tagliafico looks to be an excellent addition to an already talented Ajax squad who will soon capture the hearts of all Ajax fans.